A zoysia grass lawn will need a fair amount of fertilizer during its growth season. 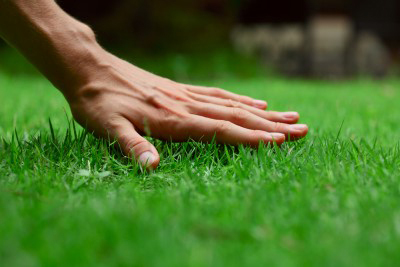 What is the best fertilizer for Zoysia grass? The goal is to supply enough nutrients for healthy growth and a deep green color, however applying too will result in growth that is hard to mow and promotes thatch. The most efficient method to fertilize is to use the dry, granular fertilizers. Liquid fertilizers work, but they are difficult to control the correct amount of fertilizer you will need. Use slow release fertilizers to sustain growth for months at a time. Soluble nitrogen is available to the grass plant immediately while slow release nitrogen works over a period of two to three months. Water approximately 1 inch after fertilizing, if you have compacted or thatch you may have to water more. Fertilizer are described by the percentages of nitrogen, phosphorus, and potassium printed in the bag. All fertilizer bags are clearly marked with these three numbers, (N-P-K ratio). Whenever possible, use a slow release fertilizer with a 3-1-2 ratio. An example would be a 12-4-8 fertilizer. A bag of 12-4-8 fertilizer contains 12% nitrogen, 4% phosphorus, and 8% potassium by weight. The remaining 76% is inert material that adds bulk to the mixture and makes it easier to spread. Use slow release fertilizers whenever possible. Soluble nitrogen is available to the grass plant immediately while slow release nitrogen becomes available over a period of two to three months. In most situations it is best to have as much of the nitrogen in slow release form if possible. Be careful not to fertilize too early. Two things will happen if you fertilize early. First, you will stimulate leaf growth at a time when zoysia roots should be growing and, early blade growth is vulnerable to late season freeze and frost damage. Mid-Summer: Fertilize again around the fourth of July. Use a complete lawn fertilizer that contains a slow release form of nitrogen. Apply at the rate of 1 pound of actual nitrogen per 1000 square feet. Water about one inch after fertilizing. Early Fall: Fertilize in September. Apply at the rate of 1.5 pounds of actual nitrogen per 1000 square feet. Water about one inch after fertilizing. Winter: Do not fertilize zoysia grass in the winter. It would be possible to stimulate winter growth and damage the roots.